For the former Maryland state highway, see Maryland Route 400. 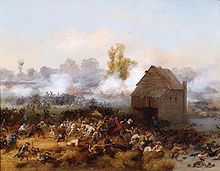 The Maryland 400 were members of the 1st Maryland Regiment who repeatedly charged a numerically superior British force during the Battle of Long Island during the Revolutionary War, sustaining heavy casualties, but allowing General Washington to successfully evacuate the bulk of his troops to Manhattan. This action is commemorated in Maryland's nickname, the "Old Line State." A monument in Brooklyn and multiple plaques were put up in the memory of this regiment and the fallen soldiers. The 115th Infantry claims lineage back to the earliest militia units formed to protect the frontier of western Maryland. The birthdate of the unit, 14 June 1775, is also the birthdate of the United States Army. The first two companies to leave Maryland were rifle companies, assembled in Frederick in the summer of 1775 under the command of Captains Cresap and Price; they were organized in response to the Continental Congress' call to active duty. They left Frederick in August and marched 551 miles (887 km) in 21 days to report to General Washington in September to support Washington's efforts to drive the British out of Boston. Later, Maryland militia companies, armed with older, surplus British muskets and bayonets, were formed and sent north to support Washington in New York City. In 1998, the Archaeological Research Center at Brooklyn College was called in by the Landmarks Preservation Commission to examine whether the Marylanders might be buried beneath the southwest corner of Seventh Street and Third Avenue. Nothing was found. Again in 2008, Third Avenue between Seventh and Eighth Street was visited by archaeologist Dr. Joan E. Geismar in conjunction with the NYC Landmarks Preservation Commission. No remains were found but she did find a buried commemorative slab. The current location is now believed to be underneath an auto repair shop parking lot in Park Slope, Brooklyn. A group of historians are currently seeking to purchase the property to again mount a search of the site for the graves. The U.S. 115th Infantry Regiment was a Maryland Army National Guard regiment that traced its roots back to the American Revolutionary War, including the men of the Maryland 400, although its official U.S. Army lineage begins in 1881. The units to which the 115th Regiment claims lineage served in the Revolutionary War and the Civil War, but the 115th itself was only credited with service in World War I, World War II, and the Global War on Terror. Prior to the reorganization into the 58th Brigade Combat Team, the 1–115th was part of the Third Brigade, 29th Infantry Division (Light). In 2006, the 115th was consolidated (merged) with the 175th Infantry Regiment. As a result of this consolidation, it no longer exists as a separate regiment. The bayonet on the coat of arms of the 175th Infantry Regiment is representative of its introduction to American arms at the Battle of Long Island 1776, by the Maryland Line and in the use of which it became famed throughout the War. It is also symbolic of the Maryland 400. The Maryland Monument is located in Prospect Park, in Brooklyn, New York City, on the slopes of Lookout Hill. Originally envisioned by Stanford White, the same creator of the Prospect Park Panthers (1898) as well as the Horse Tamers (1899). The New York Times described the monument as a "monolith of Maryland granite with bronze tablets on the four sides". The monument was built for $3,000, all of which donated by an organization by the name of "the Maryland Society of the Sons of the American Revolution." The monument is 27 feet tall, faces southwest, and is enclosed by a wrought-iron fence. It contains a 12-foot polished granite Corinthian pillar with a marble orb on top and backed by a semicircular stone wall. There is a marble pedestal which was donated by the Brooklyn Parks Department. On the east face of the monument's square base is an inscription honoring the participating Maryland 400 soldiers. The inscription reads: "In honor of the Maryland 400 who on this battlefield on August 27, 1776 saved the American army." The west face of the marble pedestal has another inscription which is a comment attributed to Washington as he watched the Marylanders hurl themselves at the enemy it reads: "Good God! What brave fellows I must this day lose." The distinctive wrought-iron basket weave fencing surrounding the monument was added at a later date to protect the monument. In 1993 a bronze marker was placed outside the door of American Legion Post 1636, at 193 9th Street in Gowanus, Brooklyn, close to the place where the men fell. It states: "In Honored Memory of Maryland's 400. Forever Remembered." ^ a b McCullough 2006, p. 177. ^ McCullough 2006, p. 178. ^ "2012_Americas Cemetery_Marylander Site Study_2010 Google Aerial of suspected 3rd Ave and 8th st Marylanders Burial Ground - Can Conservancy Balloon Mapping do Better ?". ^ "z2012_Americas Cemetery_Marylander Site Study_1916 Belcher Hyde Map of Wildhack coal yard_1916". ^ "Md. soldiers' sacrifice remembered Brooklyn: The 256 Marylanders who lost their lives in a 1776 New York battle rest in one of the most forlorn military gravesites in the nation. Members of an American Legion post fight to keep their memory alive". ^ Polk, Ryan (2005). "Holding the Line: The Origin of the Old Line State". Maryland State Archives. Retrieved 2017-11-18. ^ "A Memorial to Brave Marylanders". The New York Times. 1895-02-04. ISSN 0362-4331. Retrieved 2019-02-14. ^ a b "Shabby memorial gets face lift". The Baltimore Sun. 1991-08-20. Retrieved February 14, 2019. ^ "Prospect Park Highlights - Maryland Monument : NYC Parks". ^ "Maryland Department of Veterans Affairs". ^ Fraser, Georgia (1 January 1909). "The stone house of Gowanus: scene of the battle of Long Island". Witter and Kintner – via Google Books. ^ "Marylander Mass Grave, Brooklyn".